Discussion in 'The Observation Bar' started by KittyT, May 15, 2007. 1930 -- Ellen Church, the first airline stewardess, went on duty aboard a United Airlines flight between San Francisco and Cheyenne, Wyo. 1940 -- nylon stockings went on general sale for the first time in the United States. 1942 -- gasoline rationing went into effect in 17 states. On this day in 1940, nylon stockings went on general sale for the first time in the United States. And Abbott and Costello tried to steal a pair from Lucille Ball while Bugs Bunny rode on Lou's back. 1792 The New York Stock Exchange was founded by brokers meeting under a tree on what is now Wall Street. 1875 The first Kentucky Derby was run; the winner was Aristides. 1940 - World War II: The old city centre of the Dutch town of Middelburg is bombed by the German Luftwaffe, to force the surrender of the Dutch armies in Zeeland. 1943 - World War II: The Dambuster Raids by No. 617 Squadron RAF on German dams. Since we all have such an interest in The Golden Era, I wanted to start this thread as a challenge to everyone to really explore what happened in the daily lives of people during the 1930s & 40s. Each day, let's all try to find something interesting that happened during this period to share with the rest of the Fedora Lounge. Just minutes ago, today August 6th, in 1945 an American B-29 bomber, the Enola Gay, dropped the world's first atom bomb, over the city of Hiroshima. Approximately 80,000 people were killed as a direct result of the blast, and another 35,000 injured. U.S. President Harry S. Truman, discouraged by the Japanese response to the Potsdam Conference's demand for unconditional surrender, made the decision to use the atom bomb to end the war in order to prevent what he predicted would be a much greater loss of life were the United States to invade the Japanese mainland. Years earlier in 1936, on this same date, Pan American Airways President Jaun Trippe flew to Washington, D.C. to shake hands with President Franklin D. Roosevelt and to receive the massive Collier Trophy. Pan American Airways acquired U.S. aviation's highest award for the "establishment of the trans-Pacific airplane and the successful execution of extended overwater navigation in the regular operation thereof"...meaning that within the previous year, the four PanAm Pacific Clippers completed 70 round trips between San Francisco and Manila, and flew 6 000 000 passenger miles without an accident or even a cancelled flight. So, what else happened on this date in history? 1965 - The album HELP with The Beatles was released. On Aug. 6, 1911, Lucille Ball was born! This day in 1931, Bix Beiderbecke, jazz' second great trumpet innovator, died of pneumonia in Queens, NY, aged 28. This day in 1930, Joseph Crater, a justice of the NY State Supreme Court, stepped into a cab after dining with friends in Manhattan and was never seen again. Jesse Owens cheeses off Adolf Hitler! 1942 - U.S. forces land on Guadalcanal in Pacific, marking the start of the first major allied offensive in the Pacific during World War II. 1929 - Babe Ruth ties the record by hitting grand slams in consecutive games. 1947 - Thor Heyerdahl's "Kon-Tiki", a balsa wood raft, completes it's 4,300 mile, 101-day journey from Peru to Raroia in the Tuamotu Archipelago, near Tahiti. Heyerdahl wanted to prove his theory that prehistoric South Americans could have colonized the Polynesian islands by drifting on ocean currents. 1934 - The U.S. Court of Appeals rules that the government can neither confiscate nor ban James Joyce’s novel Ulysses. 1944: IBM dedicates the first program-controlled computer, the Automatic Sequence Controlled Calculator (known best as the Harvard Mark I). 1942: U.S. and allied forces landed at Guadalcanal, marking the start of the first major allied offensive in the Pacific during World War II. 1937: The last Cord car came off the line in Auburn, Indiana. 1937: Bunny Berigan and his orchestra recorded I Can't Get Started With You for RCA in New York. 1936: Congressman Marion Zioncheck (D-Washington) jumped to his death from a window in his office in Seattle. The 30-year-old New Dealer had been battling severe depression. 1933: Vincent Hamlin's caveman comic strip Alley Oop began national syndication. 1933: President Roosevelt agreed to remove U.S. Marines from Haiti, where they had been stationed since unrest in 1919. 1942: Humorist Garrison Keillor was born in Anoka, Minnesota. 1935: Jazz reedman Rahsaan Roland Kirk was born Ronald (not yet Rahsaan) Kirk in Columbus, Ohio. 1933: Science fiction and computer writer Jerry Pournelle (Byte) was born in Shreveport, Louisiana. 1926: Another funnyman, Stan Freberg, was born in Los Angeles. 1940 - The Battle of Britain begins as Nazi Germany launches air attacks in a sustained strategic effort to gain air superiority over the Royal Air Force. Had the Luftwaffe been successful, planned amphibious and airborne forces landings in Britain would have followed. The Battle of Britain was the first major campaign to be fought entirely by air forces and is often remembered through Winston Churchill's famous speech describing how "never was so much owed by so many to so few." The "few" to which Churchill referred were the Allied aircrews of Royal Air Force (RAF), including American Eagle Squadrons, whose desperate struggle gained the victory. The Battle of Britain was the largest and most sustained bombing campaign attempted up until that date, and its failure was considered the first major defeat of Nazi Germany. 1929 - The German airship Graf Zeppelin begins a round-the-world flight. The zeppelin was a luxury passenger-carrying airship which operated commercially from 1928 to 1937. During its Golden Era career, the ship flew 144 ocean crossings (143 across the Atlantic, one across the Pacific) carrying over 13,000 passengers with a perfect safety record, making it the most successful rigid airship ever built. It was the first aircraft in history to fly over a million miles. 08.08. on this date in the future thousands - maybe even millions - of couples will have their wedding aniversarry in years to come. In 1945, the atomic bomb "Fat Man" was dropped on Nagasaki, killing 39000 people outright and injuring a further 25000, with thousands more succumbing to radiation sickness. On August 15th, Japan announced it's surrender. August 9, 1937 -- Seconds before he was to open the evening's episode of the Pepsodent Company's "Amos 'n' Andy" over the NBC Red network, radio announcer Bill Hay suffers a heart seizure and collapses at the microphone. While performers Freeman Gosden and Charles Correll drag the unconscious announcer into the corridor to await medical help, program director Joe Parker is pressed into emergency service as announcer and signs the program on the air on time. Despite the chaos, a surviving recording reveals the broadcast proceeded without a hitch -- and the only acknowledgement that anything out of the ordinary had happened was Parker's laconic closing announcement that Hay "would be away for a few days." In fact, the veteran announcer would be off the program for nearly three months. 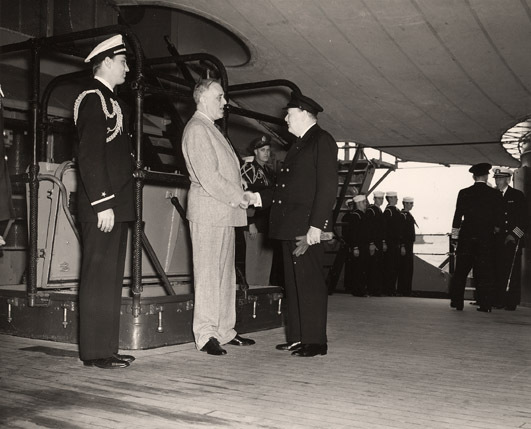 On August 9, 1941, Churchill met Roosevelt on board the U.S.S. Augusta, beginning the pattern of high-level personal collaboration that would prevail until the end of the war. The two had actually met once before in 1918, a meeting Churchill had since forgotten. In this photo Roosevelt stands unaided, relying on hidden leg braces. In later, more widely publicized photographs, he is seen supported by his son Elliott, an Air Force officer—a reminder that Roosevelt, like Churchill, had a personal, family stake in the conflict. 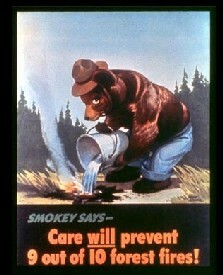 1944 - Smokey Bear debuts as icon for wildfire prevention! !